We custom build and install your Texas Safe Room. If you are looking for a Safe Room we can help you with your needs and will provide you a free quote. We have installed Safe Rooms in Dallas, Ft Worth, Sherman, Gainesville, Denton, and other cities in Texas. Typically it takes about 1 week out on new orders to have them made to your requirements and installed within 10 days of the order. Each Texas Safe Room meet and exceed FEMA requirements. They have passed the Texas Test impact Test. If you would like a quote on a Texas Safe Room call us at 405-367-7901 for a free consultation. In Texas an average of 132 tornadoes occur each year. The annual total varies. Tornadoes occur with greatest frequency in the Red River Valley of North Texas. Tornadoes may occur in any month and at any hour of the day. Usually between the hours of 4 p.m. and 8 p.m. In the period 1951–2011, nearly 62.7 percent of all Texas tornadoes occurred within the three-month period of April, May, and June. About one-third of the total tornadoes occurring in May in Texas. The largest outbreak of tornadoes on record in Texas happened in September 1967. Within a five-day period from Sept. 19–23, 115 known tornadoes were reported in Texas. On Sept. 20 Texas set a record for a single day with 67 Tornadoes. The greatest number of tornadoes happened in 1967 in Texas in a single year is 232. In 1982, there were 123 tornadoes formed in May, making it the worst outbreak of spring tornadoes in Texas. On average, May has the highest number of tornadoes per month with 39.38. January has the lowest average with 2.33. A rare winter tornado outbreak occurred on Dec. 29, 2006. There were 27 tornadoes on this day, which is the largest monthly total for December. On average, December has 3.12 tornadoes. Each safe room a 10 year warranty against leaks and corrosion. They meet and exceed FEMA standards. They have passed the Texas Tech Impact Test. You pick where the door is. Which side the handle and hinge are, and we can drill an opening for an electric cord in your safe room. Typically we can have your safe room made within a week and installed within 7-10 days upon your order. The installation only takes about 30-45 minutes. The Safe Room is delivered completely assembled. The installation crew arrives they unload the Oklahoma Safe Room . They roll it to where you want it installed and it is anchor it to the slab. If you have any additional questions please call us at 405-367-7901. Safe Rooms are a great option for someone that can’t walk down step easily and quickly. When its time to get protection against severe weather usually there is a quick notice to seek shelter. When that happens you have minutes to get to your designated area for protection from the storm or tornado. So it is critical that with a short notice you can get where you need to be. The Safe Room is installed in the garage and it can be installed anywhere on a pre construction slab. You just need to plan it ahead of time with you builder and we can help you with the project. Here is a video of a garage shelter being installed. The install went great, we are extremely pleased by the customer service of both you and your crew. For fun, I made a time-lapse video of the day and thought I’d share it with you. I’m also going to share it on Facebook to let everyone know who they should call. Feel free to share if you’d like- you were great. Thank you Leia! And enjoy your new shelter! The installation of an underground garage shelter takes about 3-4 hours. We have 3 sizes in garage shelters that will protect from 4 to 16 people. All of our garage shelter meet and exceed FEMA 320 and ICC-500 standards and they are rated to withstand a F5 Tornado. 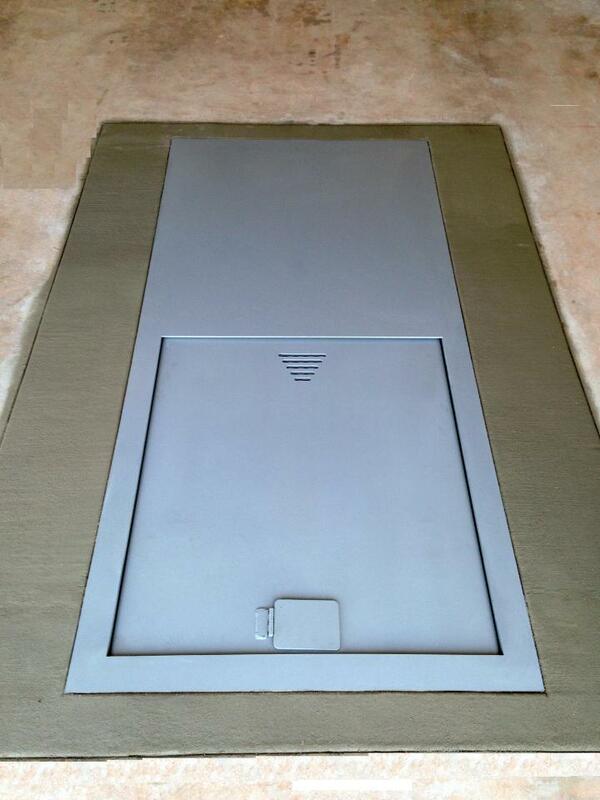 Heavy duty steel construction with 1/4″ steel plate lid. The solid steel sliding door opens easily while carrying 10x the weight of other lids. They come with a spring loaded, sliding steel latched locking point and 2 steel chain locking points with removable safety steps and benches. The shelters have a coating that prevents leaks and corrosion. They come with a 10 year warranty. The single most asked question we receive here for Storm Shelters OKC at Oklahoma Shelters is: What is the cost? All of our Storm Shelters OKC meet FEMA requirements. We have install dates within the next few weeks. They are rated to withstand an F5 Tornado. We have a Small, medium, large, and extra large. The price range for a Storm Shelters OKC depends on the size of the shelter. All of our garage shelters meet FEMA requirement and are rated to withstand an F5 Tornado. For example a medium shelter is 3’x6’x5’H and is least expensive. Then large shelter which is 5’x7’x5.5’H. The extra large shelter is 5’x8’x6’H and is more expensive because it is a bigger shelter. Convenience is the key when it comes to safety during a storm. Our underground Storm Shelters OKC can be installed in your garage and don’t require the use of valuable square footage in your garage. An underground garage shelter is also out of the weather and out of harm’s way when its time to get in the shelter during a tornado warning. If you have room in your backyard or front yard. You can also consider a Slope Top or Flat Top Cement Shelter. These Storm Shelters OKC are underground shelters and are 6’2” high. The problem in some city neighborhoods is there is not enough room to get the shelter truck in the backyard. To install an underground cement shelter we need enough room to get the shelter truck into the yard. The truck has backup to where you want the shelter to go. The sizes for Storm Shelters OKC Underground Cement shelters are, Slope Top 6’x8’x6’2” high, 7’x10’x6’2” high. The Flat Tops are 5’x7’x6’2” high, and 7’x10’x6’2” high. The underground cement shelter is typically higher then the underground garage shelters and both offer good protection against an F-5 Tornado. For people who have problems walking downstairs or need to have something wheelchair accessible we recommend a safe room. Our safe rooms are custom built and come in several sizes, they have a 3 foot door and are 6’2” high. The safe rooms are also rated to withstand an F-5 Tornado. When we install underground garage Storm Shelters OKC in the garage. We mark the floor and then cut out the slab. Then we dig out the dirt to the size required for the shelter. After it has been dug out and is level we unload the garage shelter and lower it into the whole. Then we fill the hole and concrete in the shelter. The bigger Storm Shelters OKC cost more due to fact that they have more steel for the shelter, they require more work for the install (digging and dirt removal) and more concrete when completing the installation. To get a quote on a Storm Shelters OKC you can call us at 405-367-7901 for a free consultation. Tornado season peaks in the United States in the second week of May. Most of the these storms are in central Oklahoma. Tornado season in Oklahoma starts in March. It continues in April. Then it peaks in May. In 2014 Oklahoma had the first recorded Tornado in December 2014. If you live in Oklahoma we suggest that you have a severe weather plan. For your family and any others nearby. The first thing is to think about where you will seek shelter when there is a tornado watch. But most important is when there is a tornado warning. Leaving during a tornado puts you at the risk of being injured. The best place to be during a tornado is in an underground shelter. An Underground Cement Shelter or an Underground Garage Shelter is your best protection. If you have problems walking downstairs. Or need something that is wheelchair accessible. You can get protection in a Safe Room. At Oklahoma Shelters all of our Shelters and Safe Rooms are rated to withstand an F-5 Tornado. Tornado season is starting earlier in the United States. People that live in tornado alley should be aware of this. The season has been starting earlier every year. Tornado alley does not have an exact definition. Most tornadoes happen in Nebraska. In Kansas. Also in Oklahoma. An in northern Texas. In these states the peak of tornado season was around May 26 in the 1950s. In the early 2000’s the peak has moved up to around May 19. This shift was found out by looking at all of the tornadoes. Then they removed the F0 tornadoes. They produce the least damage. That moved the tornado peak up 2 weeks earlier. This shows that tornadoes are occur earlier in present day. Then what they were in the middle of the 20th century. We don’t know is what is causing the shift. Tornado records date back to 1950. That makes it hard to do an in depth report of changing trends. In choosing an Oklahoma Storm Shelter there are some things to consider. Below we have written some suggestions to help with your decision on choosing an Oklahoma Storm Shelter. Does your property have enough access space for the delivery truck to unload the shelter directly from the truck to where it is going in your yard? Do you have 14′ height and 10′ width of clearance to get the Concrete Shelter to where you want it installed? If not, you may want to consider an Underground Garage Shelter or Steel Safe room. For those of you who like the idea of an Underground Oklahoma Storm Shelter. But you don’t have room to put one in your yard. Or you prefer NOT to have to go outside during a storm our Underground Garage Shelter would be a good fit for your needs. The Underground Garage shelter doesn’t take up any space inside your home or in your garage. In the garage it is flush with the ground and you can enter the shelter with your car parked in the garage also. We have also been able to install the Steel Garage Shelter in your back yard or front yard if there is enough room for our digger to get into that part of your property. Do you need accessibility for someone in a wheelchair or that has trouble walking down steps. If so; consider a Steel Safe Room, they are wheelchair accessible and have a 36″ wide door. 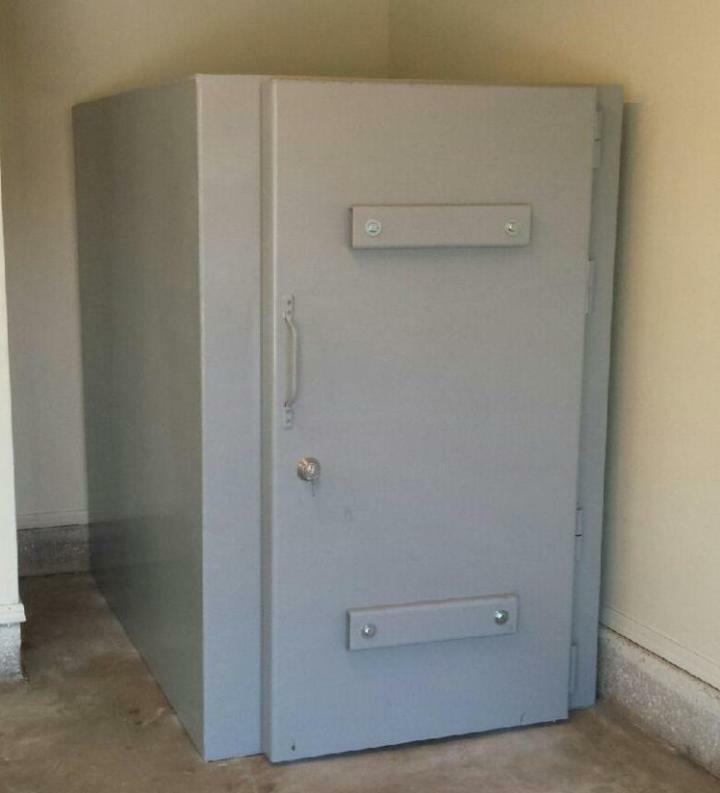 Our Steel Safe Rooms are custom built to what size you need and where you would like the door. When you stop to consider all of the options, you may feel unsure. That is where we come in. Call or email us today for a complimentary on site evaluation. We will go over all of your options for an Oklahoma Storm Shelter and help find one that best fits your unique needs.